To Cite: Naderi Nabi B, Sedighinejad A, Mirbolouk A R, Farzi F, Haghighi M, et al. The Effectiveness of Ozone Therapy in Chronic Osteomyelitis: A Randomized Controlled Clinical Trial, Arch Clin Infect Dis. 2018 ; 13(2):e61320. doi: 10.5812/archcid.61320. Background: Treatment of chronic osteomyelitis is complex and includes long-term management with antibiotics and debridement. Inadequate blood supply, underlying diseases, and deep involvement of the infected area can cause classic treatments to fail and lead to serious complications, such as limb amputation. Recently, there has been increasing interest in the use of ozone therapy for infectious diseases. Methods: Sixty patients with chronic osteomyelitis were divided into two homogenized groups: ozone therapy and control. Ozone therapy at a concentration of 30 mg/mL was performed daily by ozone bagging, minor autohemotherapy, and ozone saline injection into the bone. Data were analyzed to determine recovery and erythrocyte sedimentation rates. Results: The recovery rate was 73.33% in the control group versus 86.66% in the ozone group (P = 0.31). No significant difference was found between the groups regarding the recovery rate (P = 0.86). However, considering the erythrocyte sedimentation rate, the results were significantly superior in the ozone group (P = 0.0001). Conclusions: These findings indicate that ozone therapy, as a promising complementary treatment, can be applied in chronic osteomyelitis management. Osteomyelitis is a bone infection, which can involve different structures, such as the bone marrow, cortex, periosteum, and soft tissues surrounding the bones. The disease causes inflammation, necrosis, and new bone formation and can develop into a chronic or stable stage. Reduction in the blood supply can lead to ischemia and necrosis in the event of osteomyelitis and inhibit antibiotic release into the affected area (1, 2). Due to its high incidence and continuous emergence, osteomyelitis presents significant challenges for modern medicine. This condition is classified into acute, subacute, and chronic stages. Chronic osteomyelitis refers to a long-standing bone infection (3) and is most commonly reported in male adults following trauma or injury (e.g., surgery). It is described as a persistent infection of bones, a painful condition with movement restrictions of the affected limb (4). Untreated chronic osteomyelitis can cause avascular necrosis and formation of osteocyte islands without vessels, containing infection (sequestration). Patients with chronic osteomyelitis may face infection, frequent periods of local pain, and drainage of infected tissues through sinus ducts. Some patients may even suffer from chronic osteomyelitis for decades (2, 5, 6). Generally, treatment of chronic osteomyelitis incorporates two basic approaches: 1, surgical removal of the infected tissue (debridement); and 2, long-term administration of systemic antibiotics (3). However, this condition is difficult to treat, and administration of systemic antibiotics alone is associated with poor outcomes (6). Potential toxicity, difficulty attaining adequate concentrations at the infection site, and compliance complications should be considered, as well (7-9); therefore, search for complementary treatments seems vital. Following promising recent research on its several advantages, ozone therapy has been the focus of many researchers (10-16). Ozone seems to have the most significant oxidation effects among oxidants and is known for destroying proteins in microorganism membranes (17). Ozone (O3), consisting of three oxygen atoms, is a highly unstable gas (depending on conditions such as temperature and pressure), which cannot be stored. This component, as an antimicrobial agent, has high oxidation potential against bacteria, viruses, fungi, and protozoa (18, 19). It also stimulates blood circulation and the immune system. Several favorable characteristics, including minimal invasion, lack of allergic or toxic reactions, and absence of drug-drug interactions, justify the current interest in the widespread use of this agent (12, 17, 20). According to the food and drug administration (FDA), ozone can eliminate 99.999% of pathological masses when administered under laboratory conditions. Ozone at a medical concentration has bactericidal properties and can indirectly activate the nonspecific immune system (activation of phagocytosis and synthesis of cytokines, interferons, and tumor necrosis factors), containing humoral and cellular immune components (21). It has been shown that partial oxidation of virus receptors can inhibit virus proliferation. Ozone can oxidize compounds containing double bands, arachidonic acids and their derivatives, as well as prostaglandins. In addition, ozone regulates metabolic reactions in inflamed tissues (22, 23). In recent years, ozone has been used in different fields of medicine, including orthopedics, neurology, internal medicine, and sports medicine (24). In orthopedics, ozone is used in the treatment of lumbar disc rupture, infections caused by necrosis and compartment syndrome, and osteomyelitis (12, 13). In the past three decades, millions of people have benefited from the therapeutic properties of ozone, while no complications of acute and chronic toxicity have been observed. Ozone appears to have positive effects on the treatment of infections, especially abscesses and sites antibiotics cannot influence (25, 26). However, effectiveness of this intervention, as an adjuvant treatment for chronic osteomyelitis, has not been studied adequately, and further investigations are required. Based on the literature, the present study was conducted to investigate the effects of ozone therapy on patients with chronic osteomyelitis. This randomized clinical trial was performed on 60 eligible patients with lower-extremity osteomyelitis, who had been referred to Poursina hospital, affiliated to Guilan University of Medical Sciences (GUMS) during December 2013 - June 2014. Before recruitment of the first participant, the study protocol was approved by the local ethics committee of GUMS and registered in the Iranian registry of clinical trials (ID, IRCT201306276186N2). This study was performed in accordance with the current ethical standards of the declaration of Helsinki. All patients signed an informed consent form prior to the study following a complete description of treatment methods. All patients, aged 16 - 70 years, with chronic postoperative lower-extremity osteomyelitis and bone culture indicating Staphylococcus aureus as the true and pure pathogen of bone infection, were recruited. The exclusion criteria were as follows: 1, unwillingness to participate in the study; 2, history of psychological diseases; 3, preexisting allergies especially to ozone; 4, history of alcohol or drug abuse; 5, history of hemorrhagic infarcts; 6, active hemorrhage of any organ; 7, use of anticoagulation agents; 8, pregnancy; 9, glucose-6-phosphate dehydrogenase deficiency (favism), hyperthyroidism, or severe anemia; and 10, resistance to vancomycin based on the antibiogram. Based on a pilot study, the required sample size was determined as 30 patients per group. The expected power was 90%. Sixty eligible patients were randomly allocated to either ozone (O) or control (C) group, using randomized fixed quadrant blocks. The subjects had an equal probability of being assigned to each of the two groups. Considering the type of procedure, blinding the patients was not executable; in fact, it was unaccepted from an ethical perspective. Therefore, the subjects were informed about their groups. However, the investigator who visited them and recorded the data remained blinded; accordingly, a single-blind trial was planned. The groups were matched in terms of age, gender, underlying diseases, and bacterial strains. At the beginning of the study, plain lateral and apical radiographs were acquired, and the osteomyelitis criteria (i.e., sequestrum, periosteal reaction, reactive bone formation, and ground-glass appearance) were evaluated in each patient. In the control group, patients were treated with intravenous vancomycin (trade name, Vancocin; Jaber Ebne Hayyan Pharmaceutical company) at 15 mg/kg q12h for two months, while in the ozone group, the patients received ozone therapy in addition to antibiotics. Ozone was generated by an ozone generator (Bruchsal®, Humazone Herrmann, Germany) at concentrations of 5 - 80 mg/mL at a flow rate of 1 liter per minute. Ozone therapy was performed at a concentration of 30 mg/mL in three different ways, including ozone bagging, autohemotherapy, and intraosseous injection and washing the area with an ozonized saline solution. 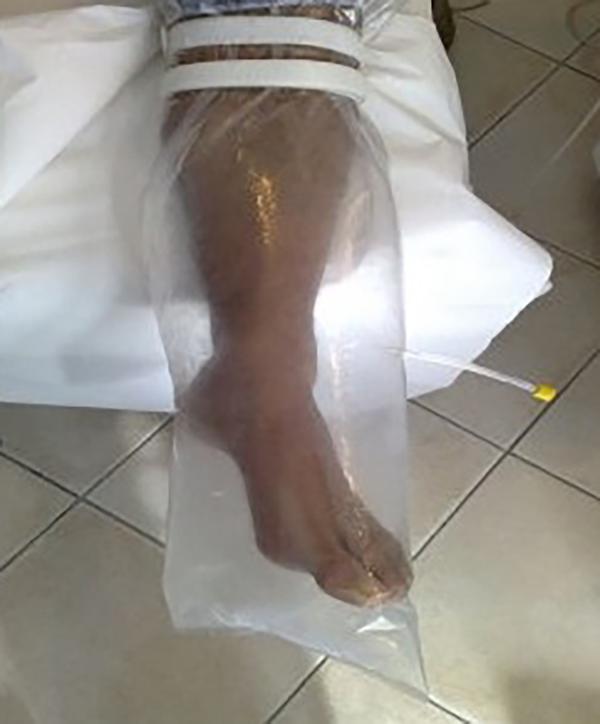 Ozone bagging: The patients were treated with bag therapy under slightly hyperbaric conditions for 20 minutes. The limb was surrounded by a plastic bag. Then, ozone gas was injected into the bag using a nelaton catheter. This method was used daily until the closure of fistula. Autohemotherapy: For each patient, 40 cc of venal blood was drawn into a 60-cc heparinized syringe. Then, 20 cc of ozone gas was added. Syringe rolling was performed for three minutes until blood was mixed with ozone. Following that, the ozonized blood was administered intravenously every other day in four sessions. Intraosseous injection and washing the area with an ozonized saline solution: In this method, 500 cc of normal saline was mixed with ozone for 20 minutes and then injected into the bone through the fistula. Eradication and washing were performed in the involved area. This method was repeated daily for the first three days and then performed every other day for 10 sessions. All patients were followed-up for six months. The radiographs were repeated in postoperative visits and compared with the initial radiographs. The patients were evaluated in terms of recovery time and incidence of complications, such as ankylosis of joints, bony fusion (complete loss of articular surface), and bone destruction (frequent bone fading on radiography). Recovery was defined as disappearance of clinical symptoms (localized erythema, pain, heat, edema, and purulent discharge) at the wound site, along with erythrocyte sedimentation rate (ESR) reduction, negative culture, and retained limb function. Debridement was performed by one surgeon using a similar procedure at a specific time interval. Statistical analysis was performed using SPSS version 19 (SPSS Inc, Chicago, IL, USA). Data are expressed as mean and standard deviation. Chi square test was used to compare categorical variables between the groups. Kolmogorov–Smirnov test was also applied to determine the normal distribution of variables, followed by parametric tests. Independent t test was applied to compare and assess parametric data between the groups. The level of significance was set at P < 0.05, and the tests were performed bilaterally. In the present study, sixty eligible subjects were divided into ozone (O) and control (C) groups. The mean age of the patients was 54.5 years (range, 30 - 65 years). Thirty-six (60%) patients were male, while 24 (40%) were female. The majority of subjects (n, 25; 41.7%) showed distal tibial involvement, while 20 (33.3%) cases had distal femur fractures. There was no significant difference between the groups regarding the baseline characteristics, including age (P = 0.261), male/female ratio (P = 0.792), body mass index (P = 0.85), early ESR (P = 0.328), and site of involvement (P = 0.0948) (Table 1). The number of recovered subjects from the ozone group was higher than the control group (86.66% vs. 73.33%); however, the difference was not statistically significant (P = 0.31). Similarly, no significant difference was found regarding the recovery period (P = 0.865). The mean early ESR before treatment showed no significant difference between the groups (P = 0.328). However, there was a significant difference between the groups in terms of ESR after treatment (P = 0.0001); the findings are demonstrated in Table 2. None of the patients developed any complications during the study. The present study focused on evaluating the effects of ozone therapy on chronic osteomyelitis of lower extremity. The term ozone (O3), which is derived from the Greek word “ozein” (odorant), was first used by Schonbein in 1840. It is known as one of the most powerful antimicrobial agents in medicine. In 1856, ozone was first used in a healthcare setting to disinfect the operating room and sterilize surgical instruments (13, 27). Ozone is known as a modern non-drug therapeutic option with bacteriostatic, fungicidal, veridical, antimicrobial, immune-stimulating, and antihypoxic properties. It also stimulates oxygen metabolism and activates the immune system (13). The detoxification effect of ozone is exerted by activation of metabolic processes in the liver and kidney. It increases the patient’s tolerability of minimum adverse effects (27). In ozone therapy, a soluble gas mixture with oxidization activity is used. Ozone is produced when pure oxygen passes through a high-voltage gradient (5 - 13 V) in a generator. Ozone improves antioxidant capacity and oxygen delivery to tissues through neoangiogenesis. It also blocks phosphodiasterase-A2 and induces antiinflammatory effects (28). According to a large number of studies, chronic ischemia delays the healing process of wounds. The responsible mechanisms include hypoxia, high-lactic acidosis, and release of reactive oxygen species and inflammatory mediators (24); ozone therapy has been used successfully for this purpose. It has been demonstrated that administration of oxygen-ozone to patients with resistant infections has positive effects (12). It is suggested that infusion of ozonated blood preserves physiological pH, growth factors, and antioxidant proteins. Therefore, by normalizing redox cycling antioxidants and detoxification system, the damaged tissue slowly regenerates and healing occurs. In this study, the resolution was confirmed by physical examination and laboratory tests. Overall, the level of recovery depends on the patient’s age and comorbidities (17). The antimicrobial properties of ozone therapy arise from oxidation of microbial cellular components. The oxidant effects of ozone destroy cellular walls and cytoplasmic membranes of bacteria. Healthy human body cells are not affected by ozone, as the uncontrolled activity of free radicals is inhibited by free radical scavengers, such as superoxide dismutase, catalase, and hydrolase. In addition, antioxidant nutrients, including vitamin C, vitamin E, beta-carotene, selenium, methionine, and glutathione, play an important role in this protection (21, 29). However, during the procedure, the presumed signs and symptoms of ozone toxicity should be considered. According to substantial evidence, this gas should never be inhaled to protect the bronchial pulmonary system. The respiratory tract lining fluid consists of a very thin and watery film, containing a minimal amount of antioxidants, which makes its mucosal cells extremely sensitive to this agent. The other known adverse effects include epiphora, upper respiratory irritation, rhinitis, cough, headache, nausea, and vomiting (27). Shah et al. (2011) (25) reported the case of a 59-year-old Indian woman with compartment syndrome following tibial fracture surgery and extensive tissue necrosis. The patient’s knee was infected by pus. He did not respond to antibiotics or wound debridement and was a candidate for limb amputation. Accordingly, ozone therapy was planned as a complementary treatment. The patient received topical ozone twice a day and autohemotherapy daily. After five days, the wound was thick enough to perform skin grafts. Topical ozone therapy was continued for five days to improve knee infection. After 20 months of follow-up, the bone and soft tissues showed complete recovery, and the patient was able to walk (25). Irban A et al. in 2015 (30) and Ozdemir H et al. in 2013 (31) showed that ozone therapy is effective in bone healing in animal models. In an experimental study from Turkey, the researchers evaluated the adjunctive therapeutic effects of hyperbaric oxygen and ozonized oxygen in 48 male Sprague-Dawley rats. The osteomyelitis model was induced by injection of 108 CFU/mL of methicillin-resistant Staphylococcus in animals. Then, they were divided into four groups: group I, vancomycin; group II, hyperbaric oxygen and vancomycin; group III: vancomycin and ozone; and group IV, hyperbaric oxygen, ozone, and vancomycin. The results showed that ozone is more effective than hyperbaric oxygen in decreasing oxidative parameters and inflammatory cytokines. The rats showed more weight gain in groups III and IV, and the number of bacteria significantly decreased in the treatment groups, compared to others. The histopathological criteria showed greater reduction in the group receiving ozone therapy and vancomycin (3). This study showed that ozone therapy might induce positive effects on chronic osteomyelitis, as ESR significantly decreased following the intervention. However, effectiveness of ozone as a therapeutic option is not associated with improved clinical outcomes, including recovery rate and time of recovery. It is obvious that the goal of every treatment strategy is to achieve better clinical effects in addition to laboratory indices. Therefore, as this intervention is safe, noninvasive, cost-effective, and easy to administer, further trials should be performed to find the optimal mode of ozone administration, case selection, dosage, route of administration, number of sessions, and intervals. To the best of our knowledge, only few studies are available on the discussed topic. Although this indicates the strength and novelty of this work, comparison of our findings with similar studies and discussions about the conflicting results are limited. First, this study had a single-center design. Second, the sample size was limited. Third, evaluation of inflammatory markers and outcomes was restricted; it should be also noted that the results might have been different if other factors were evaluated. Fourth, due to the short duration of follow-up (up to 6 months), presumed events, such as recurrence and adverse effects, might have been missed. The results of the present study showed that ozone therapy might be a promising strategy for patients with chronic osteomyelitis. This strategy was well-tolerated by our patients, who showed no serious side-effects. Obviously, before its application as a treatment protocol, future large-scale, well-planned, multicenter, prospective trials should address this issue with functional endpoints. We would like to thank the research and technology vice-chancellor of GUMS. Authors’ Contribution: Bahram Naderi Nabi and Abbas Sedighinejad, study design and implementation; Ahmad Reza Mirbolouk and Farnoush Farzi, study implementation and data collection; Mohammad Haghighi, Gelareh Biazar, and Amer Chohdary, data collection and preparation of the manuscript; Zahra Atrkarroushan, statistical analysis. Funding/Support: This study was financially supported by the vice-chancellor of research and technology of GUMS. 1. Barshes NR, Mindru C, Ashong C, Rodriguez-Barradas M, Trautner BW. Treatment Failure and Leg Amputation Among Patients With Foot Osteomyelitis. Int J Low Extrem Wounds. 2016;15(4):303-12. doi: 10.1177/1534734616661058. [PubMed: 27581112]. 2. Garwood CS, Kim PJ. Relevance of Osteomyelitis to Clinical Practice. Osteomyelitis of the Foot and Ankle. Springer; 2015. 3. Oguz E, Ekinci S, Eroglu M, Bilgic S, Koca K, Durusu M, et al. Evaluation and comparison of the effects of hyperbaric oxygen and ozonized oxygen as adjuvant treatments in an experimental osteomyelitis model. J Surg Res. 2011;171(1):e61-8. doi: 10.1016/j.jss.2011.06.029. [PubMed: 21920551]. 4. Walter G, Kemmerer M, Kappler C, Hoffmann R. Treatment algorithms for chronic osteomyelitis. Dtsch Arztebl Int. 2012;109(14):257-64. doi: 10.3238/arztebl.2012.0257. [PubMed: 22536302]. [PubMed Central: PMC3336146]. 5. Geurts J, Hohnen A, Vranken T, Moh P. Treatment strategies for chronic osteomyelitis in low- and middle-income countries: systematic review. Trop Med Int Health. 2017;22(9):1054-62. doi: 10.1111/tmi.12921. [PubMed: 28665557]. 6. Mosqueira JRM. Septic arthritis due to underlying Scedosporium apiospermum chronic osteomyelitis. Report of one case and brief review of the literature. Journal of Microbiology and Infectious DiseasesJ Microbiol Infect Dis. 2017;6(4):192-6. doi: 10.5799/jmid.vi.328943. 7. Leung AH, Hawthorn BR, Simpson AH. The Effectiveness of Local Antibiotics in Treating Chronic Osteomyelitis in a Cohort of 50 Patients with an Average of 4 Years Follow-Up. Open Orthop J. 2015;9:372-8. doi: 10.2174/1874325001509010372. [PubMed: 26322143]. [PubMed Central: PMC4549894]. 8. Tuchscherr L, Kreis CA, Hoerr V, Flint L, Hachmeister M, Geraci J, et al. Staphylococcus aureus develops increased resistance to antibiotics by forming dynamic small colony variants during chronic osteomyelitis. J Antimicrob Chemother. 2016;71(2):438-48. doi: 10.1093/jac/dkv371. [PubMed: 26589581]. 9. Conterno LO, Turchi MD. Antibiotics for treating chronic osteomyelitis in adults. Cochrane Database Syst Rev. 2013;(9). CD004439. doi: 10.1002/14651858.CD004439.pub3. [PubMed: 24014191]. 10. Turkmen A. Chronic hepatitis B and ozone therapy. J Case Rep Pract. 2015;3(2):38-9. 11. Rimini D, Molinari F, Liboni W, Simonetti V, Franzini M. The speed of reinfusion affects the vascular system during ozone major autohemotherapy. Ozone Ther. 2017;1(3):56-60. doi: 10.4081/ozone.2016.6477. 12. Franzini M, Valdenassi L, Ionita G. First evaluations of oxygen-ozone therapy in antibiotic-resistant infections. Ozone Ther. 2016;1(1):5-7. doi: 10.4081/ozone.2016.5838. 13. Re L, Malcangi G, Mercante O, Gagliardi C, Rampoldi N. Stevens-Johnson syndrome treated with ozone hemo therapy: A case report. Int J Med Pharm Case Reports. 2015;4(4):92-6. doi: 10.9734/ijmpcr/2015/18947. 14. Hashemi M, Naderi Nabi B, Saberi A, Sedighinejad A, Haghighi M, Farzi F, et al. The comparison between two methods for the relief of knee osteoarthritis pain: Radiofrequency and intra-periarticular Ozone injection: A clinical trial study. Int J Med Res Health Sci. 2016;5(7S):539-46. 15. Bocci V, Borrelli E, Zanardi I, Travagli V. The usefulness of ozone treatment in spinal pain. Drug Des Devel Ther. 2015;9:2677-85. doi: 10.2147/DDDT.S74518. [PubMed: 26028964]. [PubMed Central: PMC4440430]. 16. He W, Yu F, Duan P. Comments on "Comparison of the influence of ozone and laser therapies on pain, swelling, and trismus following impacted third-molar surgery". Lasers Med Sci. 2015;30(5):1627. doi: 10.1007/s10103-013-1476-1. [PubMed: 24292198]. 17. Borrelli E, De Monte A, Bocci V. Oxygen ozone therapy in the integrated treatment of chronic ulcer: a case series report. Int J Recent Sci Res. 2015;6(5):4132-6. 18. Akdeniz SS, Beyler E, Korkmaz Y, Yurtcu E, Ates U, Araz K, et al. The effects of ozone application on genotoxic damage and wound healing in bisphosphonate-applied human gingival fibroblast cells. Clin Oral Investig. 2017;22(2):867–73. 19. Koyama R, Okuda KI, Matsushita K, Beppu M, Mizunoe Y. Antimicrobial and antibiofilm effects of ozonated water for prevention and treatment of bone and joint infections. J St. Marianna Univ. 2015;6(1):1-7. doi: 10.17264/stmarieng.6.1. 20. Invernizzi M, Stagno D, Card S, Grana E, Picelli A, Smania N, et al. Safety of intra-articular Oxygen-Ozone therapy compared to intra-articular sodium hyaluronate in knee osteoarthritis: A randomized single blind pilot study. J Phys Med Rehabil. 2017;5(1). doi: 10.4172/2329-9096.1000385. 21. Mani A, Shukla P, Patel R, Bhople T, Mani S. Ozone therapy in Periodontics-A review. J Med Sci Clin Res. 2014;2(12):3352-8. 22. Murphy K, Elias G, Steppan J, Boxley C, Balagurunathan K, Victor X, et al. Percutaneous Treatment of Herniated Lumbar Discs with Ozone: Investigation of the Mechanisms of Action. J Vasc Interv Radiol. 2016;27(8):1242-1250 e3. doi: 10.1016/j.jvir.2016.04.012. [PubMed: 27363296]. 23. Aaron J. Smith , John Oertle J, Dan Warren D, Dino Prato D. Ozone therapy: A critical physiological and diverse clinical evaluation with regard to immune modulation, anti-infectious properties, anti-cancer potential, and impact on anti-oxidant enzymes. Open J Mol Integr Physiol. 2015;5:37-48. doi: 10.4236/ojmip.2015.53004. 24. Manoto SL, Maepa MJ, Motaung SK. Medical ozone therapy as a potential treatment modality for regeneration of damaged articular cartilage in osteoarthritis. Saudi J Biol Sci. 2018;25(4):672-9. doi: 10.1016/j.sjbs.2016.02.002. [PubMed: 29736142]. [PubMed Central: PMC5935866]. 25. Shah P, Shyam AK, Shah S. Adjuvant combined ozone therapy for extensive wound over tibia. Indian J Orthop. 2011;45(4):376-9. doi: 10.4103/0019-5413.80332. [PubMed: 21772635]. [PubMed Central: PMC3134027]. 26. Estrela C, Estrela CR, Decurcio Dde A, Silva JA, Bammann LL. Antimicrobial potential of ozone in an ultrasonic cleaning system against Staphylococcus aureus. Braz Dent J. 2006;17(2):134-8. doi: 10.1590/S0103-64402006000200010. [PubMed: 16924341]. 27. Dhingra S, Raghavan V, Kumar R. Ozone in oral medicine. Guident. 2014;7(7). 28. Elvis AM, Ekta JS. Ozone therapy: A clinical review. J Nat Sci Biol Med. 2011;2(1):66-70. doi: 10.4103/0976-9668.82319. [PubMed: 22470237]. [PubMed Central: PMC3312702]. 29. Turkmen A, Kesici S, Keles E, Denizli E, Buyukyildirim A, Kesici U. Ozone treatment in patient with multiple traumas. Case Study Case Rep. 2015;5(1):25-8. 30. Irban A, Arel Gereli A, Aydinlar EI, Karyemez PE, Luleci N, Suyen GG. The effect of ozone therapy on experimental bone fracture healing in rats. Int Res J Public Environ Health. 2015;2(10):159-66. doi: 10.15739/irjpeh.034. 31. Ozdemir H, Toker H, Balci H, Ozer H. Effect of ozone therapy on autogenous bone graft healing in calvarial defects: a histologic and histometric study in rats. J Periodontal Res. 2013;48(6):722-6. doi: 10.1111/jre.12060. [PubMed: 23452156].